Here is one of the cool designs that we are working on – of course its advanced digitizing using Tajima DG 15 embroidery software at the Maestro Level (professional level) but with enough time and patience you can do similar designs with just about any embroidery digitizing program. For this embroidery design, i am using more subdued colors than the actual picture – I think it will look better when the digitizing has been completed. The design is going to be close to a full back size – big enough to fit on the back of a hoodie or sweatshirt because I want to get all of the face and expression details into the design. 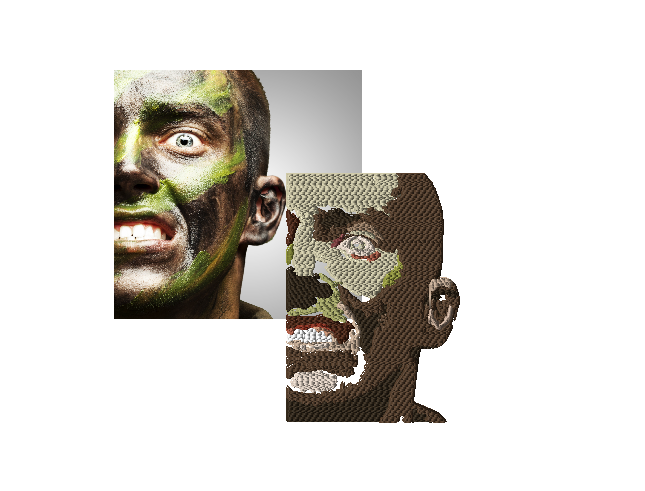 If I were to make this a small design, you would not capture the essence of the expression of the soldiers face, and of course we couldn’t use too many colors at a small size. At OML, we have one digitizer that has a definite skill for doing Pin Up Girl Designs – we have a few up on our sponsor’s site at OMLpatches.com, and he is able to capture the essence of the pin up girls in a very small area – most standard military style patches are not any bigger than 4 inches, and they have to have room for the outside merrowed edge, so the embroidery design itself is around 3.5 inches – which is a small area to do any type of detail work. He has even done some custom pin up girls and they have turned out excellent! So here is the work in progress – I think it looks good so far, and its going to be a great design when the project is done!